Nintendo Japan has announced the release date for Mario & Luigi: Paper Jam. The game will be arriving in the land of the rising sun on December 3rd. The company also showcased a tiny little image of the game’s box-art. Mario & Luigi: Paper Jam supports amiibo and is expected to come to the west next year. Meh… I might buy it if I feel theres nothing much to play on the 3DS. I know right? Lucky bastards always get the good games first. Last time that happened was Mario & Luigi: Bowser’s inside story. I’ll just wait for the next Paper Mario game since this is just a Mario & Luigi game with Paper Mario thrown into the mix. 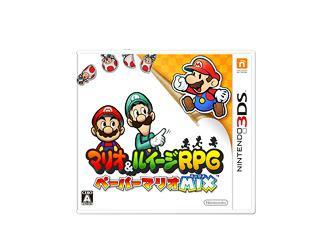 I enjoyed Mario & Luigi: Bowser’s Inside Story but I’d be lying if I said I was excited for future Mario & Luigi games. I wish these games came out on Wii U instead of the dinky 3DS. Though there’s no guarantee I’d care even then. I liked Partners In Time. Played all the way through. I also bought Bowser’s Inside Story, but when I reached Bowser, I lost the battle (after using every energy replenisher I had). After that, I lost interest and never returned. I pretty much abandoned the series. You realize those are the DS and not the “dinky” 3DS, right? They’re all just as dinky. I can’t wait for this. I found it really cool that they’re making a cross-over of both series and using a story to tie them in. Of all the crap during E3, this was one of the few things that got me excited.